The Rolf family takes a vacation from the city (the specific city is not identified in the film) at a large Victorian mansion in the California countryside. The family consists of wife and husband Marian (Karen Black) and Ben (Oliver Reed), their young son David (Lee Montgomery), and their elderly aunt Elizabeth (Bette Davis). The owners of the house are the Allardyce siblings, brother Arnold and sister Roz, played by actors Burgess Meredith and Eileen Heckart, respectively. The Allardyces appear at the beginning of the film when they inform their new tenants of a particularly odd requirement for their rental: the Allardyce's elderly mother continues to live in her upstairs room and the Rolfs are required to provide her with food during their stay. The siblings explain that the old woman is obsessed with privacy and will probably not interact with them, so the food is to be left outside her door. As it turns out, this task falls to the mother who quickly succumbs to the allure of the ornate Victorian house and its period decor. Various "accidents" occur during the summer, including the suspicious death of the renters' Aunt Elizabeth. 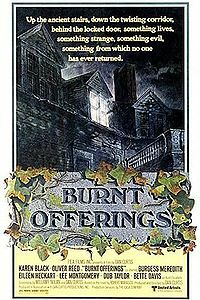 As the film progresses, Ben becomes increasingly depressed and anxious while Marian becomes increasingly obsessed with the house, the old woman in the attic, and all of the Victorian artifacts. It gradually becomes clear that Marian is somehow being possessed or controlled by the house and that a malevolent force is slowly consuming the whole family. At the climax of the movie, the house kills Ben and David, Marian "becomes" the old woman in the attic. The film ends with the house fully rejuvenated and glistening like new. The Allardyce siblings, who have not been seen since the beginning of the film, return and marvel at the house's beauty. We also notice that pictures of the family have been added to a large table covered with portrait-photographs going back centuries, implying that the house's regeneration process is as old as the house itself and that the Rolfs were simply the latest victims.